Howard Da Silva returned to the NY stage after being blacklisted in Hollywood. 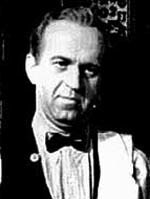 He appeared in 26 CBS Radio Mystery Theater episodes. What a wonderful, distinctive voice! I knew this guy's voice long before I knew his name. I still remember him fondly as Ben Franklin in the movie version of the hit musical "1776". To me Da Silva's almost evokes a sympathetic feeling. The epitome of the working actor--in that Hollywood sense from blacklisted actor to vindication as Ben Franklin. Birthday star Howard Da Silva's characterization of historic figures are among some of his most notable work, including Benjamin Franklin in the 1969–1972 stage musical 1776 and a reprisal of the role for the 1972 film version of the production. Howard was born on May 4, 1909. He had a very distinctive voice The CBSRMT episode 0270 "Taken for Granite" stands out-- he plays a perfect creep!